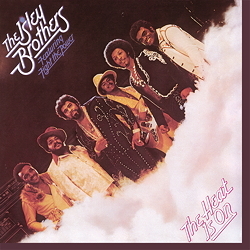 ﻿A glance at the discs, which rocked through the charts under the simple name of “Isley Brothers” will give you an idea of how a »long-lasting and self-generative family enterprise« (The Times) became a true soul factory. After a brisk start with popular rock’n’roll music, similar to that which a large number of black vocal groups turned out in the Fifties, followed a long march from one record company to another – all of whom were hard pushed to equate the dynamic musicality of these brothers with the 'own sound' of their productions. After hopping from one record label to the next, and not even getting a long-lasting break with the potent Motown label Tamla, golden days arrived when they set up their own label – T-Neck. Amidst the turmoil created by strong competition from superb studio albums, the Isleys landed a smash hit in 1975 with "The Heat Is On", an album which achieved double platinum status with its collection of perfectly written numbers. Powerful, funky volleys ("Fight The Power"), gyrating riffs as a launch pad for harmonious vocals and a creative solo ("The Heat Is On") go their own way, which is also apparent in the bell-like, airy ballads that swing along tastefully – quite without the sugar-sweet strings so popular at that time.